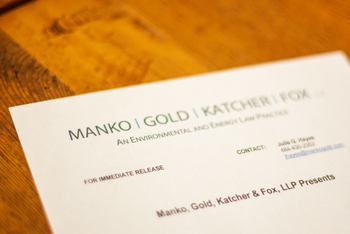 Philadelphia, PA (September 22, 2011) – Bruce S. Katcher and Jonathan E. Rinde, partners with the environmental and energy law firm of Manko, Gold, Katcher & Fox, LLP ("MGKF") spoke recently at the Builders League of South Jersey Business Management Series on "Stormwater Regulations & Enforcement in the Real Estate Development Industry: The D.R. Horton Settlement." Katcher moderated the session while Rinde detailed the D.R. Horton Settlement, the allegations by EPA and discussed similar nationwide settlements with builders.